Now Can You See Why I am Going Crazy? The dots are my average reading per day. (And if I happened to be checking repeatedly to battle a high, they all got recorded unfortunately.) The white line down the center is my “average” or what my A1C might look like when I test it in February. (About a 6.4%/138 average or so.) 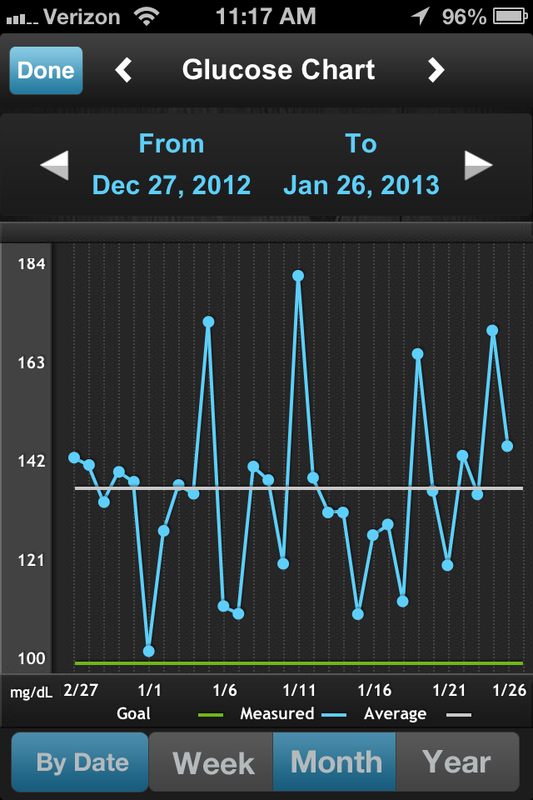 The green line is my goal: a 100 average, as that’s apparently what they want you to be as a pregnant woman. It’s a great dream to have, but I don’t think I’ll ever make it that far. If I DO get to that point, but still maintain this bi-polar control, could you imagine what my lowest average days would look like? I don’t really want to think about how much more juice I’d have to buy. I just sent my CDE a lengthy email detailing that my bolus rates are all wrong and I’m changing them again. Of course, tonight I’m going to dinner with friends and I’m not sure that’s the BEST place to try out a new insulin regiment. Wish me luck. I never give much merit to average fingerstick readings. Just as you said, the highs get exaggerated (as do the lows) due to repeated tests. If you’re watching yourself really closely, you test more often when out-of-range than in-range. That said, this doesn’t look bad, especially if you throw out two extreme highs and extreme lows for the reasons just discussed. Do that, and your vertical axis goes from about 100 to 140. That’s a small range, so any small fluctuation gets magnified. You may not be at the target you’re trying to achieve, but upon close inspection this is not nearly as bad as you make it out to be. Keep at it…you can do it! Ditto what Scott said. Most of your days are “below the line” anyway. And without going into too much detail, we all know that women have a tougher time than men do at dealing with all of this because you get all of the lousy stuff added to the equation. I think you’re on the right track. You’ll get everything evened out. By the way, looove the new look of your blog. Very nice. Thanks Stephen! Yes I finally had time to sit and figure this theme out.